کریمی, شیما, میرزاعلی, محمد, موسی زاده, حسین, قیاسی, سمیرا, تبریزی, امید. (1396). آشکارسازی تغییرات فیزیکی شهر با استفاده از تصاویر LandSatETM و مدل زنجیره‌ای MARKOV یک مطالعه در شهر اردبیل. فصلنامه جغرافیا ( برنامه ریزی منطقه ای), 26(1), 175-189. شیما کریمی; محمد میرزاعلی; حسین موسی زاده; سمیرا قیاسی; امید تبریزی. "آشکارسازی تغییرات فیزیکی شهر با استفاده از تصاویر LandSatETM و مدل زنجیره‌ای MARKOV یک مطالعه در شهر اردبیل". فصلنامه جغرافیا ( برنامه ریزی منطقه ای), 26, 1, 1396, 175-189. کریمی, شیما, میرزاعلی, محمد, موسی زاده, حسین, قیاسی, سمیرا, تبریزی, امید. (1396). 'آشکارسازی تغییرات فیزیکی شهر با استفاده از تصاویر LandSatETM و مدل زنجیره‌ای MARKOV یک مطالعه در شهر اردبیل', فصلنامه جغرافیا ( برنامه ریزی منطقه ای), 26(1), pp. 175-189. کریمی, شیما, میرزاعلی, محمد, موسی زاده, حسین, قیاسی, سمیرا, تبریزی, امید. آشکارسازی تغییرات فیزیکی شهر با استفاده از تصاویر LandSatETM و مدل زنجیره‌ای MARKOV یک مطالعه در شهر اردبیل. فصلنامه جغرافیا ( برنامه ریزی منطقه ای), 1396; 26(1): 175-189. استفاده از تصاویر ماهواره­ای می­تواند ابزار بسیار مفیدی برای تشریح روابط متقابل بین محیط انسانی و محیط طبیعی برای کمک به تصمیم­گیری برنامه­ریزان در شرایط پیچیده باشد. فرآیند توسعه شهرها یکی از نیازهای اساسی در مدیریت و ارزیابی شهرها می­باشد. افزون بر میزان رشد شهرها، مطالعه میزان تغییرات و تخریب کاربری­ها در سال­های گذشته و پیش­بینی این تغییرات در سال­های آینده می­تواند در مدیریت و برنامه­ریزی صحیح برای حل مشکلات کنونی و برنامه­ریزی­های توسعه آینده کمک نماید. در همین راستا مقاله حاضر قصد دارد تا با استفاده از تصاویر ماهواره‌ای Landsat Tm سال 1368 و تصویر ماهواره‌ای LandSatETM سال 1390 به بررسی روند رشد فیزیکی و جهت گسترش شهر اردبیل بپردازد. این مطالعه منطبق با دوره قبل و بعد از مرکزیت سیاسی شهر اردبیل می­باشد. به همین منظور پس از پردازش تصاویر ماهواره‌ای، تصاویر با روش حداکثر احتمال طبقه بندی شدند و در نهایت در سیستم اطلاعات جغرافیایی (GIS) با اعمال تابع تغییرات، تغییرات کاربری بدست آمد. با توجه به بررسی­ها به عمل آمده نتیجه گیری شد که رشد فیزیکی شهر اردبیل بعد از مرکزیت سیاسی شتاب زیادی به خود گرفته است و در طی رشد فیزیکی شهر، زمین‌های زراعی اطراف شهر به زیر ساخت و ساز­های شهری رفته است. The use of satellite imagery can be a very useful tool to describe the interrelationships between the human environment and the natural environment to help planners make decisions in complex situations. The process of urban development of cities is one of the basic needs in management and evaluation. In addition, amount of growth of cities, the study of changes amount and land use destruction in past years, and predict these changes in the coming years can help in the correct management and planning to solve the current problems and future development planning program. In this regard, this study tends to using Satellite imagery Landsat Tm in 1988 and Satellite imagery of LandSat ETM in 20011 to assess the physical growth and in order to expansion of Ardabil. This study is consistent with periods before and after political centrality of Ardabil. For this order after the satellite image processing, the images were classified using maximum likelihood method and finally in geographic information system (GIS) by applying changes function were obtain land use changes. According to the conducted investigations it was concluded that physical growth of Ardabil after the political centrality has taken great acceleration, and during the physical growth of the city, agricultural land around the city has gone under construction in the city. Abdullah, f. Alqurashi, L. K. (2013), investigating the use of remote sensing and GIS Techniques to detect land use and land cover change: a review/ advances in remote sensing, 2, 193-204. Ahad Nejad Roshaty, Mohsen, and Hosseini, Seyed Ahmad. (2011), assess and forecast changes in horizontal distribution of cities using multitemporal satellite imagery and Geographic Information System (Case Study: the city of Tabriz in the period 1389-1363), Journal of Research and urban planning, Vol. II, No. IV, spring. [In Persian]. Ali, Mohammadi, Abbas, Mvsyvnd, Ali Jaafar, and Shayan, Siavash. (2009), anticipated land use and land cover using satellite images and Markov chain models, planning and preparation space, Volume, Number Three, fall. [In Persian]. Armed Forces Geographical Organization, topographic maps 50000/1 Ardebil. Bahraini, Seyyed Hossein. (2000), modernity and then in the Urban Development, Tehran University. [In Persian]. Faizi zadeh, and Haji Mir Bakhtiar Rahimi, Seyed Mahmoud. (2008), land use change detection using the object-oriented classification (Case Study: City of Andisheh), National Conference on Geomatics, National Cartographic Center. [In Persian]. Farrokh Hsamyan, and Mohammad Reza Haeri. (2000), urbanization in Iran, Agah. [In Persian]. Gholam Ali Fard, M, Mirzaei, Mohsen and Jvrabyan SHOUSHTARI, Sharif. (2014), land cover change modeling using artificial neural network and Markov chain (CASE STUDY: central coastal province of Bushehr), Journal of Remote Sensing and GIS Applications Natural Resource Sciences, year V, No. 1, Spring, pp. 65-79. [In Persian]. 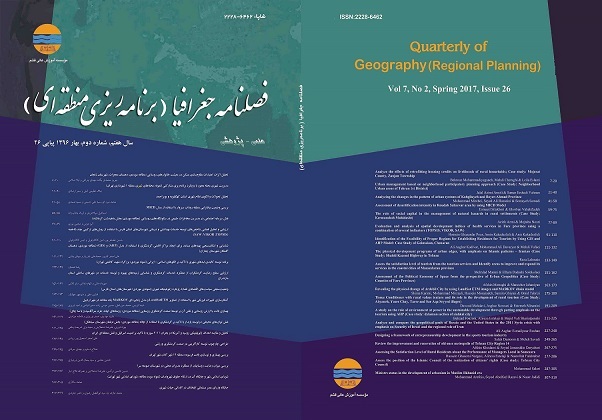 Hadavi, Framz, Timor, Asghar, Rabi'i far, but God HADAVI, MR (2013), assessment and anticipated horizontal expansion of the city of Qazvin, with emphasis on changes in land use, over the period (1986-2011), Journal of Urban Economics and Management, number five, winter. Pp. 15-27. [In Persian]. Haji Nejad, Ali, David regularly, zohreh, Abbas NiaMohsen and Poorhashem, Sima. (2014), monitoring land use changes using remote sensing (Case study: city SH), Journal of Remote Sensing and GIS application of science resources naturally, the fifth year, No. 1, Spring, pp. 2-13. [In Persian]. Hathout, S. (2002), The use of GIS for monitoring and predicting urban growth in East and West St Paul, Winnipeg, Maintoba, Canada. Journal of Environmental Management 66, PP. 229-238. He C., Okada N., Zhang Q., Shi P. and Li J. (2008), Modeling dynamic urban expansion processes incorporating a potential model with cellular automata, landscape and urban planning, No.86, PP. 79-91. Heydariyan, Peyman, Rngzn, Kazem., Maleki, Saeed and Taghizadeh Ayoub. (2014), the integration of remote sensing techniques-, GIS and modeling, model LCM approach to urban development (Case Study: Tehran metropolis), geographical studies arid areas, year V, No. XVII, fall, pp. 87-100. [In Persian]. Iranian Space Agency satellite images Landsat TM and Landsat ETM 1987 and 2011. Jenerette, G.D., W u. j. (2001), "Analysis and simulation of land use change in the central Arizon Phonix region, USA", Landscape Ecology., Vol 16, PP.611-626. Kaya, S., Curran, P.J. (2006), Monitoring urban growth on the European side of the Tstanbul merropolitan area, International Journal of Applied Earth Observation and Geoinformation 8, PP 18-25. Kazem Alavi Panah. (2003), use of remote sensing of Earth Sciences, Tehran. [In Persian]. Landsat satellite images.Remote Sens.Environ, 113:957-964. Malihe, Hamidi and Mohsen Habibi. (1997), Skeleton Tehran's structural, technical consulting and development organization of Tehran. [In Persian]. Mc Gill, Ronald.1998, Urban Management in Developing Countries. Cities. Vol, 1. No 6. Mohsen, Habibi. (1997), the flux to city, Tehran University. [In Persian]. Mousazadeh, Hosein, Bazi, KHodarahm, Krami, Shahab, Zangiabadi, Zeynab (2015), To Determine Areas Prone to Physical Development of the Analytical Hierarchy Process (AHP nine degrees) Poldokhtar studied in Iran, Journal of Applied Environmental, May 2015. [In Persian]. Musazadeh et al. (2015), population and migrant’s location detection using Hot spot in GIS model, geo-political Seventh Congress of the city the Association of Iranian geopolitics. [In Persian]. Rahimi, Akbar. (2014), the modeling the development of Tabriz in 1410 by using LTM, two Journal of Urban Ecology (Geography and Regional Planning of the former), Volume 5, Number 10, Fall. [In Persian]. Rolando, E., Caravantes, D. and Sánchez-Flores, E. (2010), Water Transfer Effects on Peri-Urban Land Use/Land Cover: A Case Study in a Semi-Arid Region of Mexico, Applied Geography, Vol. 31, No. 2, PP. 413-425. Singh, P. and Khanduri, K. (2011), Landuse and land cover change detection through Remote Sensing & GIS technology: case study of pathankot and dhar kalan tehsils, Punjabl/ international Journal of Geometrics and Geosciences, 4, 839-846. Wakode, Hemant Balwant, Klaus, Baier, Ramakar, Jha. & Raffig, Azzam. (2013), Analysis of urban growth using Lands at TM/ETM data and GIS- a case study of Hyderabad, India. Arabian Journal of Geosciences, 7(1), 109-121. Wyman, M.S. and Stein, T. V. (2010), Modeling Social and Land-Use/Land-Cover Change Data to Assess Drivers of Smallholder Deforestation in Belize, Applied Geography, Vol. 30, No. 3, PP. 329-342. Yu, W., Zang, Sh., Wu, Ch., Liu, W. and Na, X. (2011), Analyzing and Modeling Land Use Land Cover Change (LUCC) in the Daqing City, China, Applied Geography, Vol. 31, No. 2, PP. 600-608. Yuan, F., Sawaya, K.E., Loeffelholz, B. and Bauer, M.E. (2005), Land cover classification and change analysis of the Twin Cities (Minnesota) Metropolitan Area by multi temporal Landsat remote sensing. Remote Sensing of Environment, 98: 317-328.